In a meeting at the White House yesterday, U.S. President Barack Obama and Pakistan's relatively new Prime Minister Nawaz Sharif reportedly discussed a wide range of topics, including the U.S. troop withdrawal from Afghanistan, India-Pakistan relations, and U.S. drone strikes. While a positive step forward in a recently strained relationship, the meeting highlighted a continued sticking point over military cooperation on the Pakistan-Afghanistan border, says Asia Society Senior Advisor Hassan Abbas, author of the forthcoming book The Taliban Revival: Violence and Extremism on the Pakistan-Afghanistan Frontier. "The U.S. drone strike policy is increasingly becoming a divisive issue between the two states, and this is likely to continue till Pakistan takes effective counterterrorism steps on its Pushtun frontier," Abbas told Asia Blog. Abbas also noted that the U.S. will take a wait-and-see approach to Sharif to ensure he can bring stability to a country that voted in his civilian government this May. "The U.S. wants to give sufficient time to Sharif to settle down and show he believes in the principle that continuation of democracy in Pakistan is the best way to strengthen and stabilize the country," Abbas said. A day before the meeting between Obama and Sharif, the U.S. released $1.6 billion in military and economic assistance to Pakistan it had suspended after disagreements about the U.S. raid that killed Osama bin Laden. Abbas told the BBC ahead of the meeting that the release of the aid was a "positive development" that showed relations between the two countries are improving. Listen to Abbas's October 23 Newshour interview about the meeting here (interview begins at 42:30). 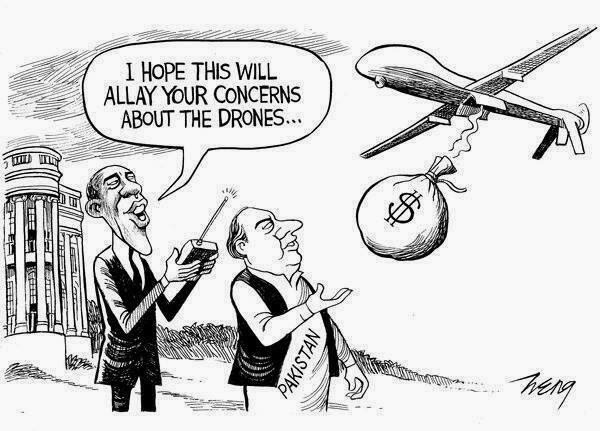 Miyan sahab had to be more specific about Drones.. This issue has to be resolve..